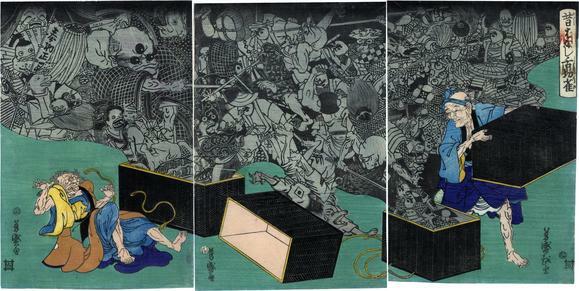 A triptych illustrating the legendary folk story of 'Shitakiri suzume' - the Tongue-cut Sparrow. A greedy old woman chooses the heaviest chest, which she believes to be full of riches, but which turns out to be full of demons, goblins and spectral sparrows. Version in collection of Kumon Institute of Education. Illustrated in black and white in Ukiyo-e Masterpieces in European Collections: Musées Royaux d'Art et d'Histoire, Brussels, vol. 9, Kodansha, 1989, p. 203, #125. Here is the description given by Christie's auction house: "The Tongue-Cut Sparrow, is a story about an unpleasant old woman who was doing her washing when a sparrow that belonged to her gentle and pleasant husband ate some of her laundry starch. The angry old lady cut off the bird’s tongue and chased it away. Saddened by the loss of his sparrow, the husband set off to find the it. He eventually found its house where he was warmly received by the sparrow and his family. As an omiyage, the sparrow offered two wicker baskets of different sizes. The unselfish husband accepted the smaller basket and went home, whereupon gold and silver treasure appeared in the basket. In her greed, the nasty old lady wanted more and therefore set off to the sparrow’s house and accepted the large basket. However, when she took the lid off, a troop of demons appeared from inside and killed her."